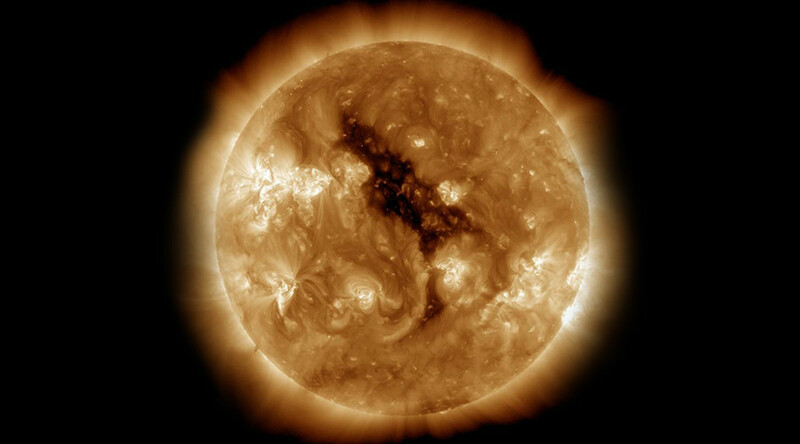 A massive coronal hole on the sun is currently facing Earth, directing a solar storm at our planet which can potentially wreak havoc on communication and electrical systems. On the plus side, though, the storm also means an increase in spectacular aurora borealis displays. The geomagnetic storm was predicted by SpaceWeatherLive after it noted the return of a massive coronal hole that had faced Earth a month ago. “She's back! That massive coronal hole system that faced us four weeks ago is back and it survived its trip around the far side of our star. “This truly gigantic coronal hole managed to cause geomagnetic storming conditions on five consecutive days during the first five days of this month. Fantastic auroral displays were reported from all around the world,” the website reported. During its last rotation the solar winds also reached moderate storm levels - however scientists believe the hole has actually increased in size since then, according to the site. 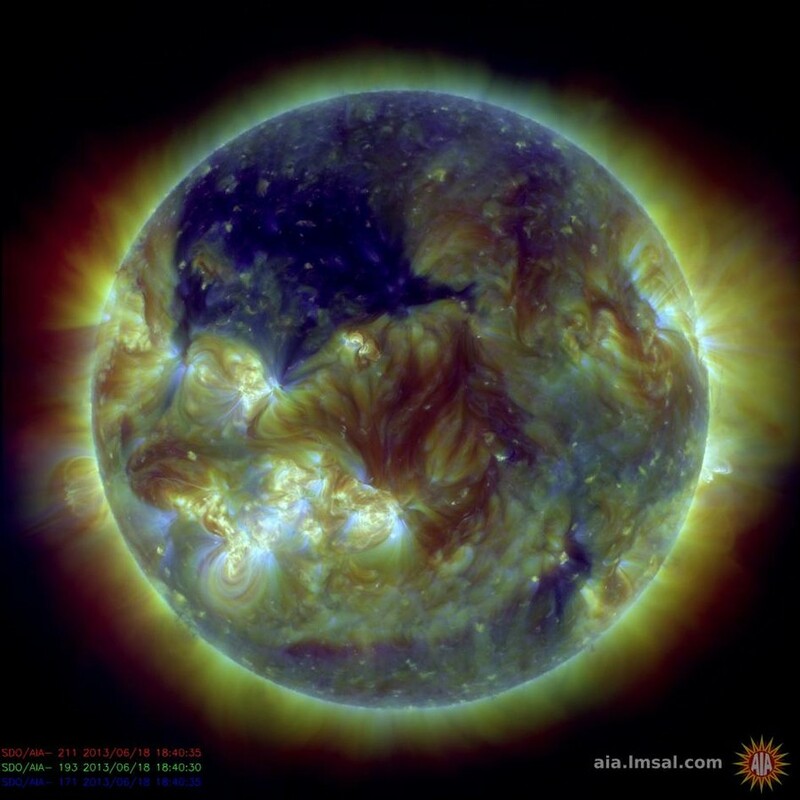 The NOAA Space Prediction Center has issued a G2 (moderate) Geomagnetic Storm Watch alert. Level G5 (extreme) is the highest rating. Solar storms are eruptions of mass and energy from the surface of the sun which can collide with the Earth’s magnetic field. Auroras are produced by the interaction of solar winds with the Earth’s magnetic field and atmosphere. As the coronal hole has rotated around the sun’s surface and now faces our planet, the winds are stronger and there is a spike in geomagnetic activity. This is good news for Northern Lights enthusiasts, who have more chances to catch a better glimpse of the amazing aurora displays during the solar storm. Solar storms can have serious consequences if they are powerful enough though, knocking out communication systems and disrupting electronics possibly for several years. The largest geomagnetic storm on record, the Carrington event, took place in 1859, knocking out telegraph systems across Europe and the US. Earth had a lucky escape in 2012 when solar storm of similar power occurred but missed striking the planet. Earlier this year space weather specialists warned governments to prepare for the potential devastating consequences of geomagnetic storms. Particularly powerful solar storms can also corrode water and sewer pipes, wipe out computer memories, and disrupt navigation systems. They also pose a risk for astronauts in space who may be exposed to levels of radiation, beyond their prescribed exposure levels, within hours of a powerful solar storm.